Disruption has many lenses. Here we explore Creative Disruption, developed within the confines of the advertising industry as an agent of pattern interruption. Language is hugely important, as is consensus. Problems tend to manifest when there isn't an alignment on key terms - different stakeholders have different definitions which means the application has the potential to break down. This series takes a look at the varied definitions of the term 'disruption', and how this differs across advertising, organizational strategy and the tech industry. Disruption can be transformative, but if a clear definition is lacking in a desired context, activity may be doing more harm than good. Part 1 begins with the birth of disruption, and how this was applied through the lens of creativity, developed as an agent of the advertising industry. “Who’s Leading the Ad Industry? The world’s leading agencies are no longer shaping the advertising business. Little by little, they have become simply suppliers to their clients. The symptoms are clear. Too many agencies define advertising in conventional terms, perform its conventional tasks, and turn out the conventional product. They don’t train people, build on their knowledge base, or have any vision of where the industry should be headed. Meanwhile, clients have changed. Many are in zero-growth markets were every gain is a rival’s loss. Others are under attack from numerous nimble, niche players. Some are at odds with their own distributors. And these are just some of the challenges. Today, companies either manage their markets or their markets manage them. We have all seen entire sections of industry disappear from one day to the next, from one continent to another. Successful companies now know that it is not enough to adapt, to follow customer needs. Rather, the challenge for companies today is to lead their customers to create change in the markets and manage that change to their own advantage. What's most amazing is that this article was published in 1992. We tend to stare into the precipice every 25 years or so as a new wave of innovation strikes. History doesn’t repeat, but it sure does rhyme. To understand what was going on, we need to examine the Umwelt of the time. We need to think about the environment. The World Wide Web had only just gone live in 1991, largely only to university-based scientific departments or physics laboratories. The PC market was gaining steam, with Microsoft solidifying its monopoly - but even then, Internet Explorer wouldn't be released for another three years, in 1995, and email was still in its infancy. Today’s dominant GAFA upstarts were still a twinkle in their founders eyes. Amazon went live in 1995, Steve Jobs returned to Apple in 1997, Google launched in 1998, and Facebook was founded twelve years later in 2004. The tech revolution wasn’t even here yet. So why all the doom and gloom? Since the Mad Men days, Advertising's share of GDP has remained consistent at 1-2%, so when the environment is in turmoil, there is a natural tendency for advertising to feel the second order effects. But this felt different - the question had became if something more fundamental was missing from the equation. “Organizations based on the “Command and Control” principles of the 1910s are too costly, too slow to adapt, too unresponsive to customers, and too limited in creativity and initiative to respond effectively to the competitive challenges of the 1990s. Many companies are beginning to experiment with a new set of organizational principles. Few have yet made a complete transformation, but there is much to be learned from the efforts under way. Rapid technology change and the new pressures of globalization were massive forces. With more streamlined manufacturing processes, an emergent, cheaper and more competitive Asia, and the formation of the EU in 1993, the transformation narrative had begun. This is where we started to see dominant terms like self-managing or cross-functional teams, speed to market, continuous improvement, flat structures, and an adaptive customer (not supervisor) focus. We had entered the era of the bottom-up re-org. If the business world had begun the process of navel gazing, the advertising industry had begun to mirror this. When a general malaise as to the role and purpose of advertising starts to enter the conversation, what changes need to be made, and what new models emerge? Before 1992, disruption was a dirty word. ‘Disruption’ was most commonly associated with ‘Creative Destruction’ - Schumpeters’s Gale - as outlined by the work of economist Joseph Schumpeter, who in turn derived it from the work of Karl Marx. His work helped create the theory of economic innovation and the business cycle. In essence, burn it all to the ground if you want to build something new. Disruption was the lesser cousin to this destruction. To disrupt was to disturb. It was primarily used to describe the effects of natural disasters by the media, and have overtly negative connotations. But the creative industries started to see disruption as more of a positive, a necessary process that could have a transformational impact if applied correctly. This could become their new rallying cry, to create a framework for making sense of the chaos of the environment. BDDP (who became TBWA in 1998 after merging with Chiat/Day) are not the first agency to intuitively apply disruptive thinking to marketing. They are however recognized as the first to try and quantify it by creating a disciplined method to be applied systematically - Chairman Jean-Marie Dru was the author of the original WSJ article referenced above, where he outlined the theory of Creative Disruption. “Disruption is not a pretty word. But it clearly states what we want to do for our clients: destabilize the conventions of their competitive environments. Specifically, Disruption means identifying, questioning, and overturning the conventions that define an existing marketing situation. Such conventions exist everywhere - no matter the brand, category or marketplace - but they are usually hidden. Conventions are the unquestioned assumptions, the common sense wisdom, the current rules of the game that comprise the status quo in one’s marketplace. A disruptive messaging is designed to interrupt the mediocrity in the deluge of advertising the consumer encounters. Creative disruption helps disturb the normal flow in the way a human processes a massive volume of marketing messaging, so they pause to consider the communication they have received. It’s pattern interruption. What minimalism writers would call “Burnt Tongue”. Whether they understood it at the time or not, this had its roots in human biology, and the interplay of System 1 and System 2 thinking. We tend to move through the world in System 1 mode making unconscious decisions until we face the truly novel - this then engages our rational System 2 so we can evaluate and actively assess new information. Developing marketing messages which will be remembered and acted upon (which will improve performance/ROI of marketing expenditures). Improving brand perceptions and other market indicators (e.g., awareness, understanding, interest, or engagement). Disrupting the flow of traditional marketing strategies to make existing business and marketing techniques obsolete. Creating new business innovations that lead to new markets and new marketing techniques. 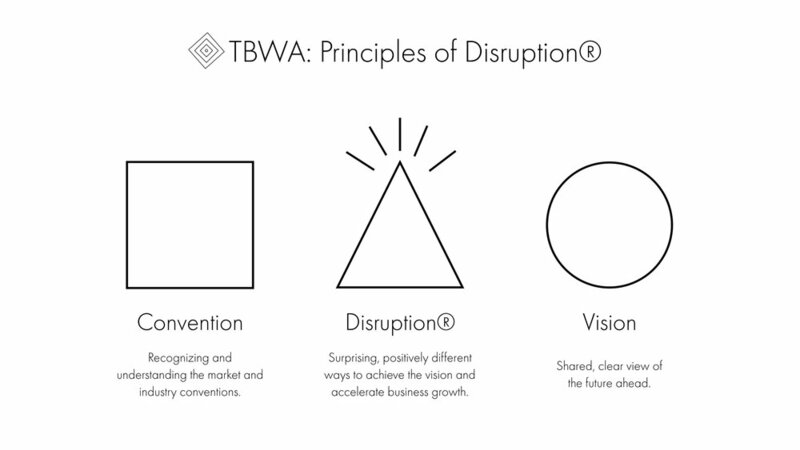 TBWA created its own systematic process to both communicate and execute the theory. Define the box you need to think outside of. What are the consumer patterns? What is your brand baggage? What are the emerging cultural trends? What world do we want to be in? What are some provocative ideas to get there? How do we crush convention? How do we Interrupt the pattern? This process was often presented by the agency as a Disruption Day, a live workshop designed to crack a brief. In many ways this was a precursor to a lot of Experience Design processes like the Design Sprint. Disruption Days tended to start with a systematic analysis of conventions. Instead of differences, you look for commonalities - these often show where conventions exist to be broken. It highlights points of collective blindness. The second part of the morning focuses on Visions. The group jumps forward five years to imagine what the possible futures of the brand might be. This is designed to break linearity and avoid simply only working from contradiction. In the afternoon, the group conducts a series of “what-if” sessions. This is an identity switching exercise that is aimed at breaking down the inhibitions linked to the clients corporate culture. Often the technique of role-playing is employed, putting people in the mindset of innovators like Steve Jobs or Richard Branson (“what would they do?”). Finally, the group returns to the Vision. The after influences the before, and the execution influences the idea. This is often summarized with an exercise in creating “headlines”, imagining the perfect title of a laudatory article describing the idea in the Wall Street Journal or Financial Times. Each sequence of the day is accompanied by voting mechanics, and the entire day is packaged up in a deck for the client. From its introduction, codifying Creative Disruption had a huge impact on the advertising industry, and often the ways in which brands communicated with prospective customers. As existing primary channels (TV, print, radio) became more and more viewed as interruptive, advertising moved out into world (the fact that this created even more interruption in the day to day tended to be glossed over). Everything became a medium for communication, which in turn meant the landscape became a hell of a lot more complex. More channels meant more choices, and so naturally, Comms Planning became a discipline that had merit. Michaelides & Bednash, often considered the first Comms agency, opened its doors in 1995, creating a new model for adding rigor to where a message lives. Creative Disruption as differentiator also helped launch new advertising powerhouses. The Crispin Porter + Bogusky ‘Hoopla’ methodology owes a lot to the original thinking of TBWA, and the disruption shift. An agency is often best characterized by its primary research source. The new breed of ‘disruption’ shop made the shift to planning via a proposition built from category conventions. If there is a fundamental flaw in Creative Disruption, it may well be in the place it has the most leverage - away from advertising itself - which creates a double edged sword. Jean-Marie Dru himself recognized that Disruption should be applied beyond just communication, attempting to define this as a series of concentric circles. In the center is the business model, or how the organization makes money. The second circle is the products or services it offers. The third is marketing, or how those products and services are proposed to consumers. The last circle is advertising or the message being communicated. Disruption can intervene at any of these levels, however the closer it is to the center, the more solid or durable the effects. In this way then, advertising relegates itself to the icing on the cake (or the much cruder lipstick on a pig). Advertising can help interrupt the pattern and find novel ways to drive a message home, but if the foundations of the business model or product are not sound, lasting change cannot be achieved. And with most briefs to agencies being pointed around communication (the realm of the CMO), agencies struggle to move to the middle (the realm of the CEO). The other legacy has been Advertising agencies obsession with pattern interruption at the expense of value. New technology should mean an evaluation of the foundations of the business model, value chain, distribution channel, or a recognition of emergent customer behaviors - instead, agencies are relegated to applying disruption through an obsession with “firsts” - being the first people in market to use a new technology or to fill up decks with outlandish and unachievable vaporware. How many decks are there in agencies across the board right now featuring a mashup of Jimmy Fallon, Childish Gambino, Pokemon Go, Drones and a VR Headset? That's not to say Creative Disruption doesn't have its place. Without this approach we wouldn't have a gorilla playing the drums to Phil Collins. We wouldn't have a man who doesn't look like your man but who your man could smell like. And we wouldn't see an ad, only to realize it's a Tide ad. What we need to do is recognize and be honest about the limitations of Creative Disruption so we can focus on its strengths. So as a summary, Creative Disruption is best defined as pattern interruption, through the use of advertising and marketing, to create novel ways in which to capture the attention of an audience. But when it only sits at the level of communication, it can lack true, transformative change. Here's the rub. If you asked anyone from Silicon Valley or the wider tech industry how they define disruption, they will likely have a very different understanding of the term. In Part Two of this series on the language of disruption, we will explore a different kind of theory that has underpinned a lot of the companies that emerged from the garages of California, and a very different book that was also released in 1996 that developed the theory of Disruptive Innovation. Sign up for updates to find out when Part 2 is released. Disruption: Overturning Conventions and Shaking Up the Marketplace.